CPARLENE requires no cleaning! Individual student face masks provide maximum protection against cross contamination. Each face mask is designed with a one-way non-rebreathing valve and is disposable or may be reused after proper disinfection. Molded hair requires no maintenance. The disposable tracheal airway and lower airway with lung bag eliminate time-consuming disinfection procedures. Includes 10 disposable airways, 10 disposable tracheal airways, and five sanitary face masks. Electronic monitoring allows trainees to critique their performance at a glance. 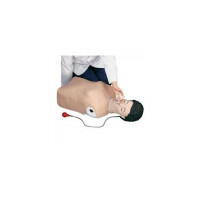 All electronic monitoring units are housed outside the CPARLENE manikin, connected by a quick-release interface jack similar to a telephone extension. 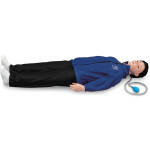 Portable electronics allow monitors, not students, to be moved from manikin to manikin. Helps reduce cross-contamination. All units are powered by "C" or "D" batteries, and change from adult to child readings with the flip of a switch. 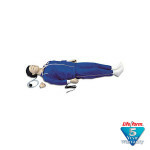 All electronic CPARLENE models come complete with a washable jogging suit; child springs; and a hard carrying case with wheels. 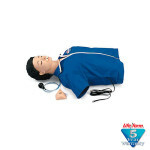 These manikins provide maximum student/instructor feedback in four practice modes: compression rate, compression depth, ventilation duration, and ventilation volume. Red light indicates improper hand placement. The performance of each skill is displayed separately while averages are stored in the memory. 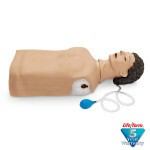 With the flip of a switch, memory unit evaluates performance based on child or adult CPR standards. The manikin with both memory and printer will print out test strips that plot and tabulate test performance skills indicating good, high, and low results in either adult or child mode. Power saver feature automatically turns unit off, but retains previous data. Low battery indicator. Three-year warranty. 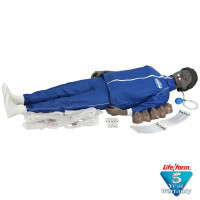 CPARLENE Brand Full Manikin with Memory and Printer, Sanitary Head & Molded Hair - Dark Skin.